This healthy version of Pumpkin Chai Tea Latte beats the commercial drinks when it comes to nutrient value and quality ingredients. This Halloween don’t get tricked into ordering high-calorie, nutrient-void, coffee drinks full of scary ingredients like artificially flavored and colored syrups. Instead, treat yourself to this healthy version of a seasonal favorite — Pumpkin Chai Tea Latte. The benefits? You can control the calories, the caffeine content, and the ingredients. And even save a little cash while you’re at it! Plus, you’ll actually get some health benefits. For example, pumpkin is plentiful when it comes to nutrition. It contains vital nutrients, such as the powerful antioxidant beta-carotene, Vitamin C, and potassium, and it even has fiber, which aids weight-loss by making you feel fuller. Beta-carotene, which gets converted into Vitamin A in the body, has been shown to help improve eye sight and potentially prevent cancer. Also, chai tea is hard to beat with its high-antioxidant content and digestion-aiding ability. So give this easy and delicious recipe a try. It’ll warm you up on a cold night of trick-or-treating! If you’re sensitive to caffeine, try decaffeinated chai tea. Also, pumpkin butters abound this time of year, but making your own is worth it, because you can control the amount of sugar added and use organic pumpkin, too. 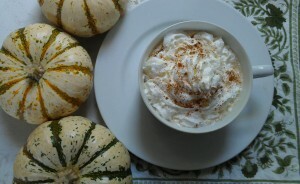 Check out this recipe by The Gracious Pantry for a homemade pumpkin butter that doesn’t use sugar. By the way, if you don’t have pumpkin butter on hand, substitute it with a little canned pumpkin puree, pumpkin pie spice, and agave syrup or stevia. Add steamed milk to boiled water. Steep a chai tea bag for about 5 minutes. If you steep it longer, the tannins in the black tea will make it bitter. If desired, top with whipped cream for a special treat! Copyright © Karen Peltier and Well Gal, 2013-2017. All rights reserved. ← Fish Oil: Friend or Foe?